Bob Nettleton of Hornick, Iowa, said he has always loved the Wildfowl Boats and Blinds Contest. He has owned and built 12 boat blinds over many years of waterfowl hunting, including three commercial blinds and nine of his own design. 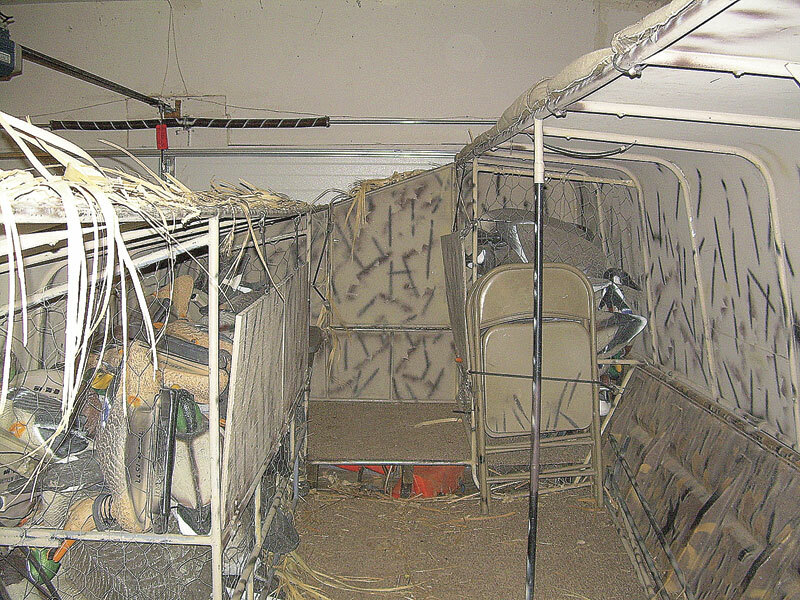 "After using all of these blinds, I found that I prefer a blind built specifically for my boat and hunting conditions," Nettleton said. "I have used my current blind for three seasons, which is rare for me. I haven't rebuilt it, because I haven't come up with a better idea or found anything to complain about." Nettleton's nitpick blind is built onto an 18-foot aluminum johnboat with an open hull design. Powered by a 50 hp outboard, the boat is also used for fishing during the summer. Therefore, the blind must be easily removable following the waterfowl hunting seasons. The boat blind has a 27-inch high front section and a 36-inch high back section, with both sections curving into the boat gunwales contours. A center aisle allows easy access throughout the length of the blind. It holds three hunters, and can hunt a fourth if everyone is familiar with the blind's confines and layout. The boat blind is 14 feet long, stretching from the forward deck of the boat to the transom. It is 7 feet wide. The front and back sections curve an equal distance inward from the gunwales, leaving the access aisle open in the center for great stability when hunters are walking amidships. 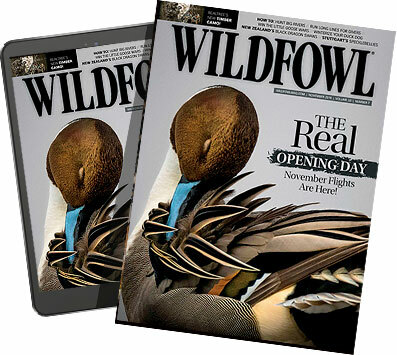 "The low front allows a clear view of distant birds while the semi-high back allows you to tuck yourself away from the wind, hide from birds overhead and allows you to shoot 360 degrees," Nettleton said. "Because the blind is only 3 feet higher than the side of the boat at its highest point, it also creates a low profile that doesn't stick up like some blinds do. I've noticed that most people are the same height from the waist up, so the blind is still very comfortable for tall people." Nettleton said curving the blind to create a top covering is extremely important. If the blind has an open top, he has noticed that many ducks flare away as they spot the hunters attempting to hide inside. But the bow of the boat is not covered, leaving the factory installed forward deck platform open for easy hunter access. The forward deck also provides a place for a retriever to shake off water outside of the blind and allows better visibility while the boat is underway. Additional features include decoy storage, gun storage, stove and heater, and hunter seating. "The blind is built for ruggedness, light weight and portability," he said. "I needed a blind that was tough enough to last indefinitely because the cost of building a different blind every year was mounting. I also needed a blind that was portable enough to come off the boat in summer. It also had to be light enough that it didn't weigh the boat down, creating a huge draft that would make it hard to push it into reeds or onto a sandbar." Nettleton had tried many different materials for constructing the frame and skin of other blinds. He found the materials he had used — canvas, burlap, PVC and other materials — were not durable. "Wood is heavy, even cedar," he said. "Screws rust, material rots or tears, things come loose and you're back to building a new blind next year. One day I was helping a friend put together a shed made from prefab steel frames and aluminum skin and it dawned on me that the stuff was light and strong and doesn't rust or break. I knew this is what my next blind would be made of, so I went back to the drawing board." Nettleton found aluminum sheeting about half the thickness of his johnboat hull at a metal supply company. He also found 1-inch square tubing, but it was expensive, and he was advised to weld the frame for durability, rather than bolt it together. Uncertain about welding the frame because he had no welding experience, Nettleton went home and checked his garage. He found some ½-inch electrical conduit left over from an earlier project. Purchasing more of the conduit was inexpensive, costing $2 per 10-foot section. "At the metal supply store the next day, we found that the electrical conduit welded perfectly," Nettleton said. "That summer, I welded the frame for the blind. The supports were curved using a conduit bender. The aluminum skin was fastened to the frame with self-tapping screws. I used weather stripping between the supports and the skin to prevent rattling. To secure the blind frame to the boat, I used four, 2-inch long U-bolts." The U-bolts fit over handle-like conduit loops welded to the bottom of the frame and projecting to the interior of the boat. U-bolts were placed through holes drilled into the tops of the boat gunwales. Then, the nuts were tightened and the tips of the U-bolts cut off and ground to remove sharp edges. For additional support, conduit fasteners were also screwed to the frame and gunwales using self-tapping screws. To remove the blind, take out the U-bolts and the screws holding the conduit frame to the boat. A door was added to allow access from the forward deck. It is secured with a continuous hinge bolted in place. "The blind is rock solid and is light e nough for one person to lift it," Nettleton said. "I can drive down the road at any speed with the blind in place." Painting aluminum is not as simple as painting other materials. Nettleton discovered that cleaning the aluminum with alcohol and using a base coat of metal primer help paint adhere. He painted the blind with a finish coat of flat tan and added dark stripes.Using metal pipe straps, he fastened sections of 2-inch-by-4-inch wire fence to the outside of the boat. His original concept called for using native vegetation to camouflage the blind. But he decided to use woven palm mats because of their greater durability and lighter weight. He fastened them to the wire fencing with zip ties. "Since I store my blind outside, I remove the grass mats and put them back in the original box each year," he said. "By storing them inside my garage, I've been able to use the original 14 grass mats for four or five years." To cover the access aisle during hunts, Nettleton cut camouflaged Cordura fabric to fit and fastened with zip ties along the high side (back) of the blind. It is secured to the low side with small bungee cords. Five sections of Cordura were used, one for each hunting station. Each hunter rolls up the section at his shooting port and the fabric stays in place at the ports without hunters to keep out the elements and assist in hiding the blind.Each hunter station also has a grass mat that folds down to cover the aisle. A piece of 4-inch-by-4-inch wire fencing secured with wire ties folds from the rear to cover about half the distance across the aisle. A grass mat is secured to the fencing with wire ties, leaving enough grass to hang down to provide cover for the shooting port. "When it's time to shoot, the window fencing and grass mat cover is so light, you just stand up and the window flips up and out of the way," Nettleton said. "To cover the motor, I use a cheap camo motor cover I have had for years and cover that with a grass mat. A bungee secures the grass mat to the motor. I remove the motor cover and stow it when the hunt is over. I cover the bow with leftover grass mat scraps and toss them in the decoy bin when I'm not hunting. Every inch of the blind is covered with grass, so it blends into the surroundings like no other." The main decoy bin is built into the center of the low (front) side of the blind. It extends to the aisle and 2 feet upward from the bottom of the boat. The conduit frame of the bin adds support to the blind frame. Rustproof chicken wire is secured to the conduit frame with pipe straps. The ½-inch plywood doors are secured to the frame with door hinges. The doors lay flat for easy access and also rotate into the decoy bins to create shelves for gloves, ammunition and other gear during the hunt. Another decoy bin is built at the front of the boat. The hinged door provides a seat when folded inward, rather than a shelf. On a typical hunt, the two decoy bins hold 15 Canada goose, 20 super magnum mallard, 60 magnum mallard and 12 standard mallard decoys. A heater and stove are secured with bungee cords to the side of the main decoy bin. A 20-pound propane tank is secured inside an old milk crate in the stern. Folding chairs metal chairs are stowed against the back of the blind using bungee cords. Spinning-wing decoys are stowed in a plastic storage bin near the bow, out of the way. A gun rack welded to the top of the frame secures firearms in soft cases.The blind is almost completely enclosed when set up for hunting. Nettleton said comfort is a big factor in his hunting success. "It's more enjoyable for me to sit in a comfortable chair in a nice, warm blind with some breakfast and coffee when hunting ducks than it is to sit in a stand of wet reeds freezing my tail off and dreaming about a warm vehicle to go back to," he said. "The more comfortable you are, the longer you can sit and wait for ducks. My blind provides exceptional protection from the elements. It allows me to hunt on those days when other hunters stay home because of the weather conditions. The wind can blow as hard as it wants and the temperature can drop well below freezing. But I will still be out there, hunting, because I have built my blind with comfort being a focal point."